Domino's Pizza opened their first New Zealand store in 2003. At the beginning there were seven locations throughout the country and all the marketing and print requirements were managed in-house from their Porirua store. Since then Domino's has been in a steep growth curve and now have 119 stores across New Zealand. This growth has also driven change within the organisation and in particular the approach to marketing needs. 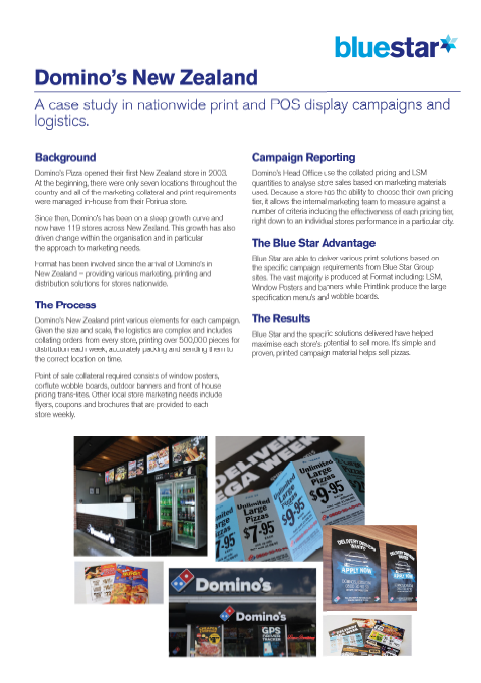 Format has been involved since the arrival of Domino's in New Zealand - providing various marketing, printing and distribution solutions for stores nationwide. Copyright © 2016 | Blue Star Group (New Zealand) Limited | All rights reserved.